I am in a band that now uses 2 L1 Classics. We have a Soundcraft Ui24 digital Mixer that we put everything through. 2 Guitars acoustic and electric, Keys, Bass, Roland e-drums, 5 vocals. I have read all of the connection threads here, but I haven’t been able to see any specfic to this Mixer. The Mixer has a L and R out in XLR and 1/4 inch and currently we have everything panned to the center. On one of the L1s I have tried the XLR to XLR into Input 1 on the L1 to eliminate noise, however I think the line level feed is really exaggerating any noise in the system. The other unit I am going 1/4 to 1/4 into input 1 . Both L1 units are set on 58. So my question is , What’s the best configuration to maximize the performance of the L1s with my Mixer? I.E should I be going into inputs 3 or 4 with the outputs from the Soundcraft ui24 or should I stick to the 1/4 on 1 or 2? From what I understand its a 19.5db output. But I could be off there. Looking your expert help on this one. We have a gig in a week and it would be great to have this dialed in prior. Its taken us a while to finally upgrade to this level of equipment so now I want to make sure I have the configuration right! Do you have the L1 systems behind the band? Here's why I'm asking. On one of the L1s I have tried the XLR to XLR into Input 1 on the L1 to eliminate noise, however I think the line level feed is really exaggerating any noise in the system. How long are the cables from the Ui24 to the L1 systems? If the cables are less than 20 feet, you may be okay with the 1/4 inch (6.3 mm) inputs on the L1 systems. Normally you would prefer balanced connections, but in this case the signal from the Ui24 may be too high for the XLR inputs on the L1 systems. The L1 Classic XLR inputs are designed for microphone level sources. A line level source is likely to clip them. If you're not getting excessive line noise with the 1/4 inch connections, then it may be simpler to use those on both L1 systems. Note: all 1/4 inch inputs on the L1 systems are unbalanced. That's why I asked about cable lengths. That would be appropriate for DJ tracks at high volume (emphasis on lows and highs). Use Preset 00. This will give you a flat response and let you control the EQ from the Ui24. Use 1/4 inch inputs on channel 1 or 2. Set the trim so the LEDs are solid green with occasional flickers of red. ST thank you so much for the reply! That’s Great information ! I am familiar with having the L1s behind us however we will be putting them out front at this venue. We all wear IEMS as we each control our own independent mix in our ears. Sometimes the bass / guitars do not wear the IEMS but that is predicated on the venue. I know they are not necessary with the L1s but switching at this point would be difficult especially for the vocalists. I plan on going no further than 25 feet as to maximize the 1/4 cable potential before noise. I recently purchased new 25 ft 1/4 cables with full shielding and heavy insulation. THe information on the Trim is very interesting. I have a question. Will making this adjustments MAX out the volume? I.E. I have a remote for each unit, will I be able to INCREASE or DECREASE the Volume from there? Or do these settings become null and void? I think the SoundCraft UI24 has an output of 19.5db is this to high for these inputs? What I am trying to achieve is the optimal setup for the L1s they are incredible and I would really like to be able to maximize them to their potential to deliver both super clear and if necessary high volume sound? I also have 4 B1’s in the mix I probably should have mentioned earlier. You don't need the R1 Remote - and I don't use it when I'm working with third-party mixer. It's simpler to do without. Will the L1 Classic still work without the R1 Remote? The PS1 Power Stand (Classic) / Model I continuously senses activity at all preset selectors and what is connected at the input/output jacks. The PS1 Power Stand (Classic) / Model I can however function without the R1 Remote. If you power the PS1 Power Stand (Classic) / Model I on without the R1 Remote connected, it will operate as if the R1 Remote was connected and at a fixed setting of 12 o'clock (center position) on all the control knobs. Alternatively, if the unit is powered on with the R1 Remote first connected and the user then disconnects the R1 Remote, it will retain the last settings of the R1 Remote before you disconnected it. This is helpful in the case where sharing may be necessary. Even without the R1 Remote control the system can get to full output if the input trims are carefully set. If you do proper gain staging, the system will get to full output with all knobs at 12 o'clock. 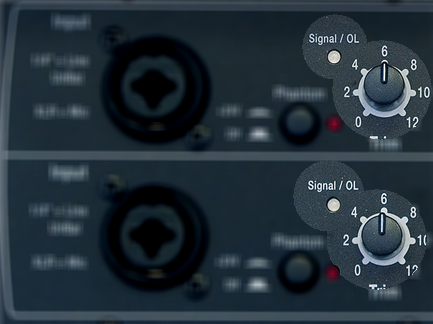 Since proper gain staging is not trivial, we provide the extra gain to take up the slack if the input is not quite hot enough. It will be fine with the 1/4 inch inputs (without the R1 Remote). It might be too high for the XLR input. Be sure to rehearse the hardware setup before the gig so there are no surprises. tjsybsll makes a lot of sense. i think this is my last question. My mixer has both digital controls and manual external control knobs for volume. Is there a rule if thumb on where to set the manual control knobs? I would like to set the knobs and forget it but I’m not sure if that’s right? Thanks again for all the great information ! I looked at the ui24r owners manual and could not find any information about the Mix L / Mix R controls. It looks like they have emphasized the mark at 2:00 o'clock. I'd probably set the control there and control the volume using the software interface. While I was looking at this, it raised the possiblility, you might be able to use XLR cables. By turning down the Mix L / Mix R controls, you can lower the output levels enough to be compatible with the XLR inputs on the L1 Classics. You'll have to experiment with these ideas. I don't have any way to simulate the outcomes. Thanks again for all your great advice. I will experiment and let you know which config we end up using.